School is back in session, and alongside all of the homework and new best friends is the greatest class of all: science. Science class is where we learn to expand our minds to universal possibilities while performing some cool experiments. As a bonus, your child’s science schoolwork often presents opportunities for family bonding and creativity. So let’s invigorate your science-loving family with an easy, at-home science project for your kids. And what’s more fun than building your own flashlight with common household materials, and then telling spooky Halloween stories afterward? 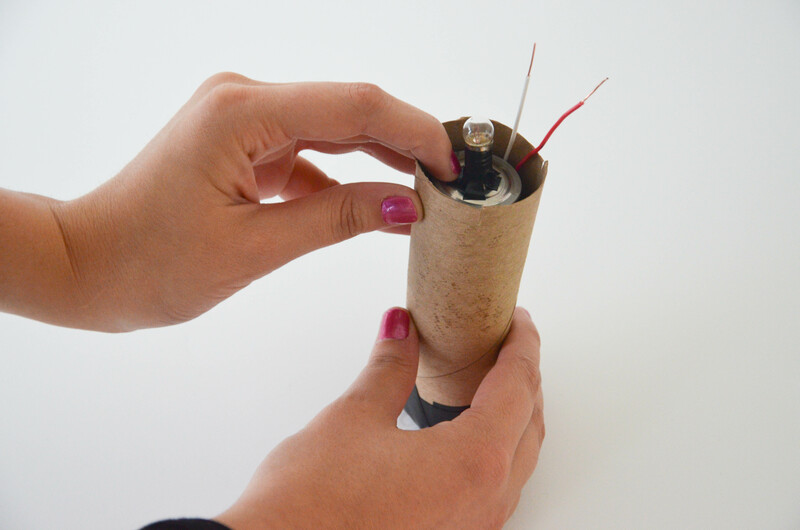 Making a homemade flashlight is a fun, simple science experiment for kids that teaches them how a conductive material like copper carries an electrical charge to a small lightbulb. Although this flashlight won’t be robust like a Rayovac flashlight, they can last for a while, especially if you use sturdy construction materials. 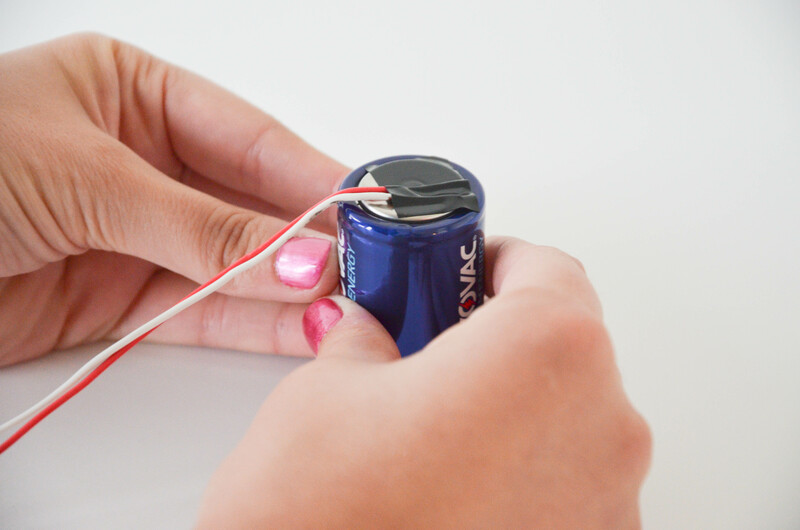 Much like the tomato battery we showed how to make as a summer science project, this experiment demonstrates how electricity from a battery flows through conductive materials to provide power to everyday objects. Once your child understands how an electrical connection and circuit work, they’ll never see the world the same. A piece of copper wire that is at least 5” long. 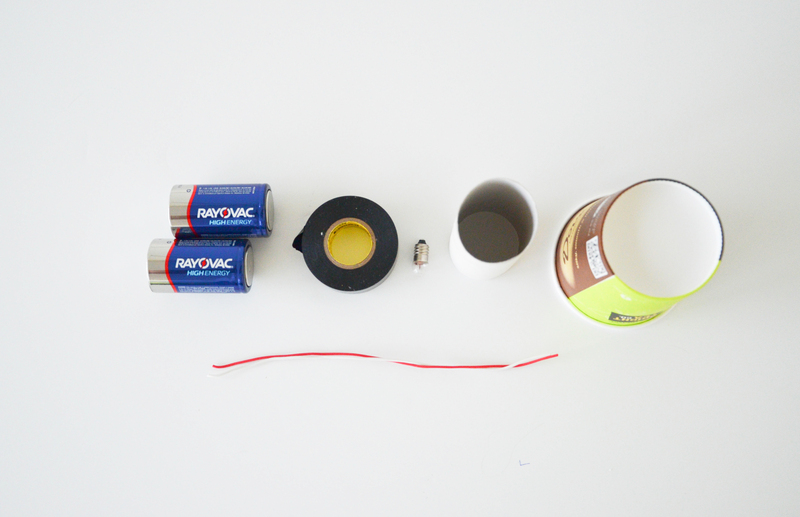 Step 1: After you gather the materials, you’ll need to tape the one end of the copper wire to the negative end of one of the batteries. Don’t be afraid to use a decent amount of tape to ensure the wire is flush and snug against the negatively charged end of the battery. 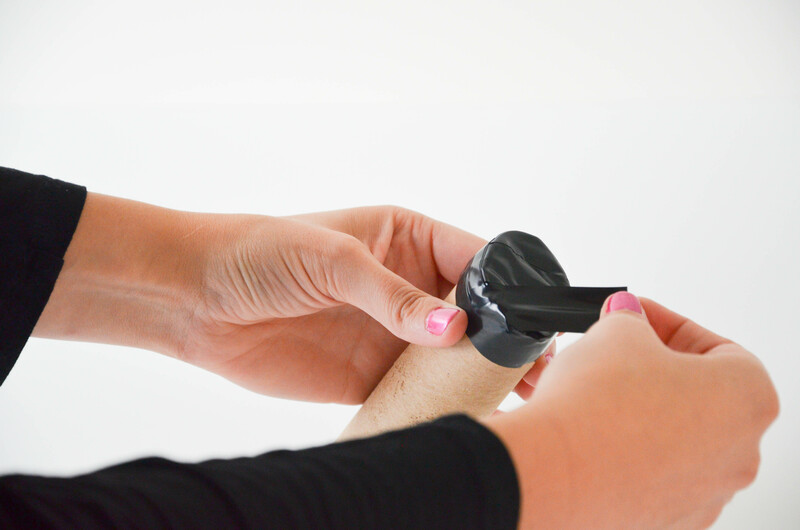 Step 2: After the wire is securely fastened, tape the black cloth to the bottom of your sturdy tube. Hold the covered end up to a light source and peer into the tube; double check that no light sneaks its way through the cloth and into the tube. 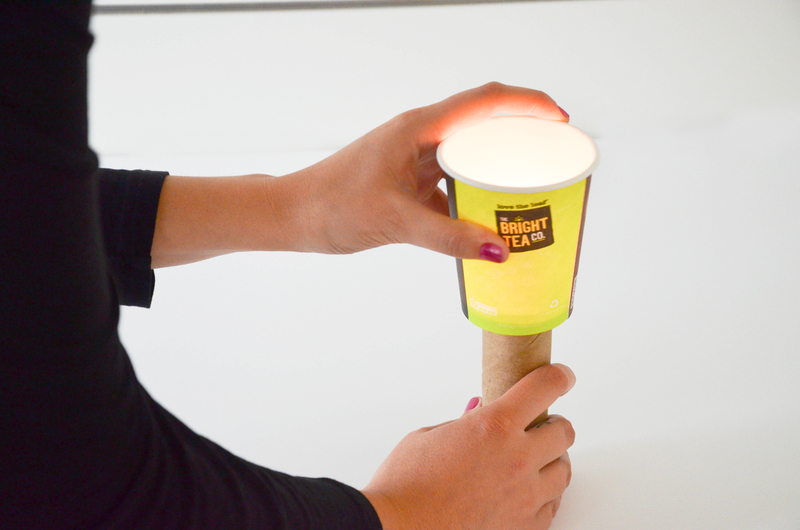 If you do see any light, add a layer of tape around the spot. Any light that makes it into the device dilutes its ability to output light. If you don’t have a cloth, then you can just tape the end of the tube. 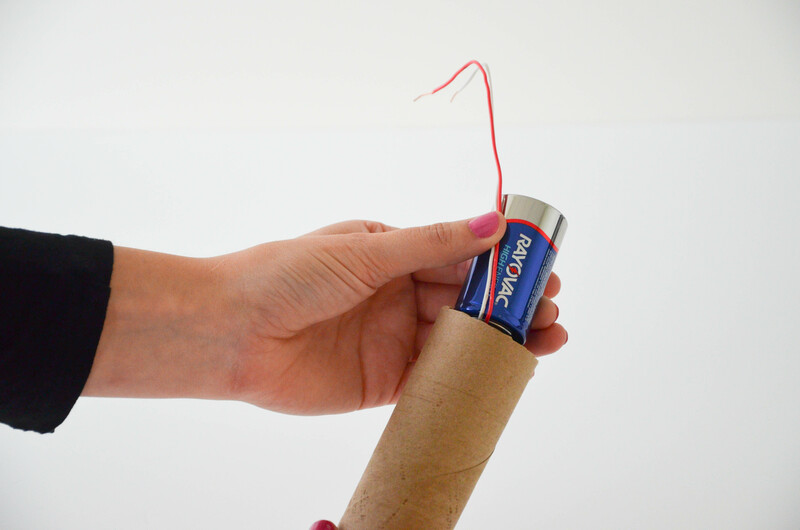 Step 3: Insert the battery you’ve taped—wired end first—into the tube. Finagle the wire around in the tube until the non-taped end is sticking out of the tube. In case the wire isn’t long enough to stick out of the tube, you’ll either need a longer wire or a shorter tube. Step 4: Insert the next battery —negative side first—into the tube. The battery should rest flush against the one below it. This allows electricity to pass between the two batteries, from a cycle of electrons flowing from the positive connector to the negative. Step 5: Tape the bulb to the top of the battery, touching the exposed positive node. You’ll need to keep a small amount of the bulb’s metal base exposed for the last step, but do make sure the bulb is securely fastened to the battery and has the maximum amount of metal-to-metal surface area contact. 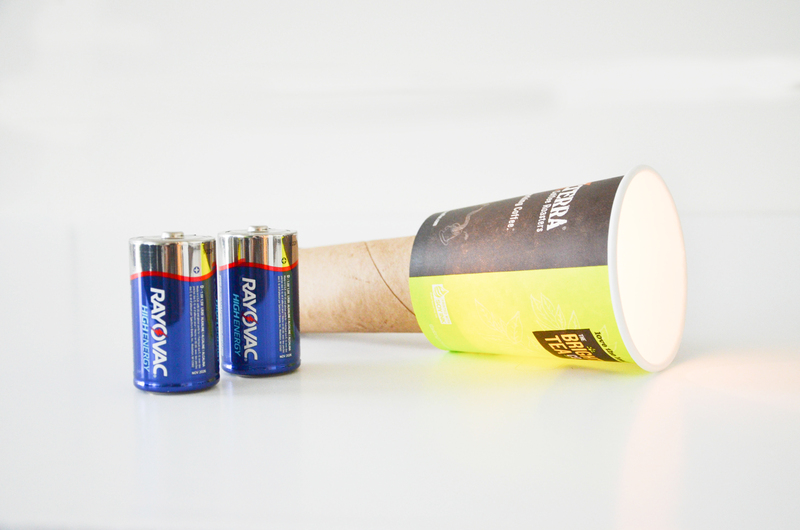 Step 6: Cut out a small hole in the paper cup, fit it over the lightbulb and tape it to the tubing. 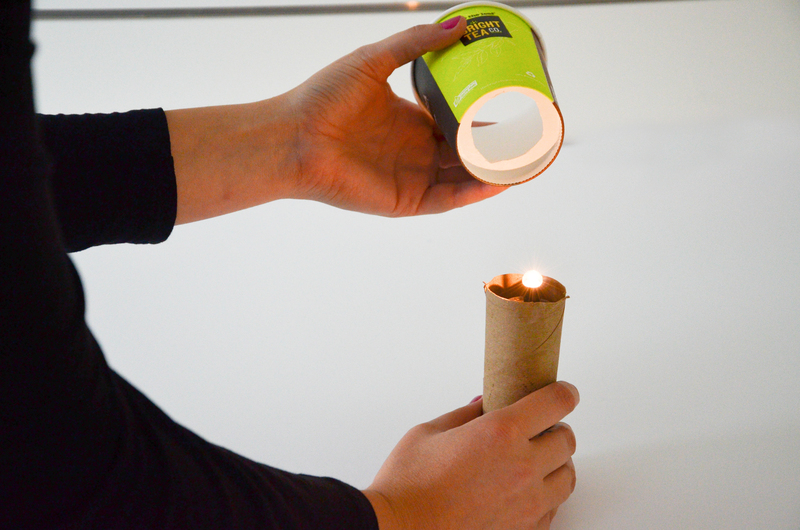 Step 7: Finally the payoff; now you get to light up your flashlight. 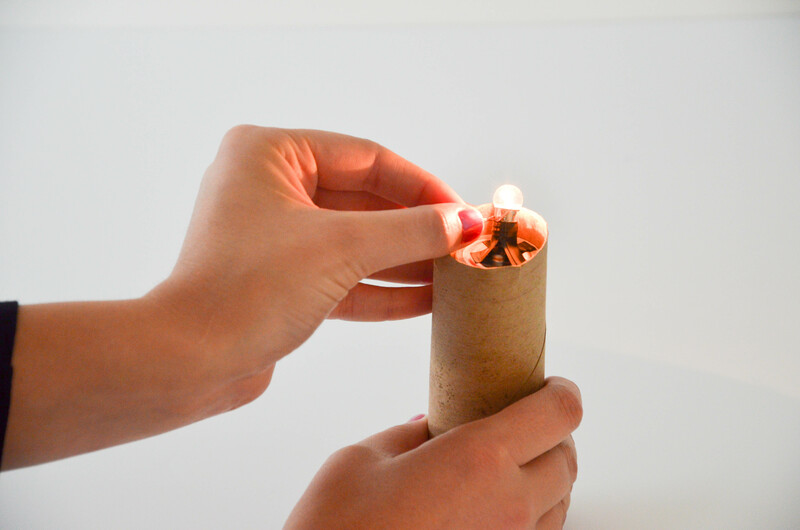 Take the end of the wire poking out of the tube and touch the exposed part of the bulb. This connects the battery circuit and gives the bulb power. It should light up immediately after the bulb base and copper wire touch. If you want to keep the bulb lit, gently wrap the wire around the bulb base. To turn the flashlight off all you have to do is move the copper wire away from the bulb. That’s it, you’re done! Now it’s time to gather the family around your new light, turn out the others and tell some spooky stories. Just in time for Halloween. Have you heard the grim tale about a man named Tim who chose the wrong batteries? It’s one of our favorites. Watch it here.